The one ingredient missing from your diet plan. So you say you want to lose weight, eat better, get fit, etc… but the problem is, you’re chronically stressed out. As a result, you’re likely not eating well, not getting enough sleep and not dealing with anxiety or any mental/mindset issues that you need to work through. Well here’s the truth, sister — if you want to beat the bloat and shed some extra pounds, you need to assess your stress. 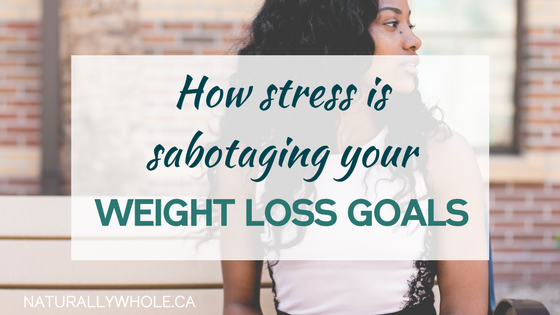 Here’s how stress can sabotage your weight loss goals. Stress management is an indispensable part of weight management. When you’re stressed out, your body experiences an increase in cortisol, the hormone that basically tells your body that you MUST eat sugary, fatty comfort food upon pain of death. Not only is this obviously undesirable if you have some fitness goals to crush, but it spills over into other areas of your life. People turn to many different vices to take the edge off — and food is just one of them. The need to immediately soothe stress can create more typical life-sabotaging addictions like food, drugs, or alcohol, but there’s also the tendency for busy overachievers to self-medicate by becoming more busy (often to the point of exhaustion). It is possible to “binge” on a work session, event-hopping or finding new leads for your business– anything to distract ourselves from a deeper issue at hand. You’re tired so you skip breakfast and of course have no willpower to resist the donut table at the office. You then feel like garbage all day because you haven’t kept up with your goal-achieving activities. Enter self-loathing and thoughts of “what does it matter anyway?”, “I’ve already failed.”, “what’s the point?”. And there you are, right back at square one (or worse). You’re sick of this cycle and desperately wish it would end. You’re ready to finally beat this thing and take control of your health and body once and for all. Working on your mindset is a lifelong endeavour, but being intentional about getting your mind right will help you ward off feelings of discouragement, defeat, and outright burnout when you’re trying to get in shape. A positive mindset is key for keeping stress in check. It’s not that you’ll never experience stress, it just won’t take over your life and trigger a downward spiral. Life gets hectic sometimes. It’s inevitable and not inherently bad, but what matters is how you respond. The stories that you tell yourself about those situations is really what’s going to make the difference. People talk about weight loss, fitness and other surface goals as things they’d like to achieve, but during health coaching sessions with clients, I like to dig deep. Until you get to the root of your issue and deal with that, you won’t be able to break free from the cycle. What is the driving force behind your stressed out state? Once you target those feelings, you can flip the script on the stories you’ve been telling yourself and nip that stress in the bud. Only then will things start falling into place. If you want to be successful with your health, weight loss and fitness goals, fight away stress by banishing negative thoughts and taking care of yourself on the inside, not just the outside! I know you have big plans for yourself this year. There will be challenges and massive growth, but these will only make you a more whole, balanced person and the best version of yourself. Here’s to unapologetic balance and thriving in all areas of your life! Originally published at www.naturallywhole.ca on January 16, 2017.